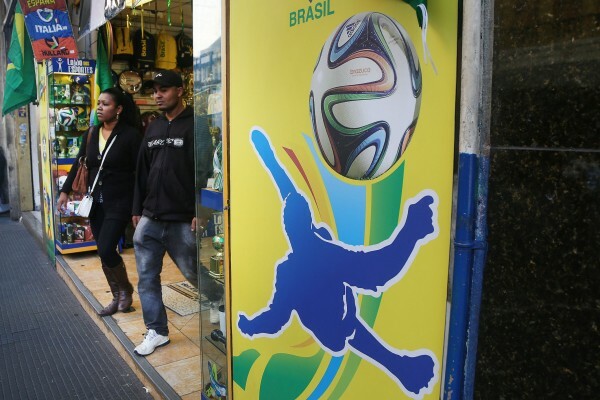 Some 3.7 million people, including nationals and foreign tourists, are expected to travel within Brazil during the month-long FIFA World Cup, which begins on June 12, the Ministry of Tourism said this week following a survey conducted with the Economic Research Institute Foundation (FIPE). This figure is broken down into two blocks: Brazilian and foreign tourists attending World Cup events will total 1.9 million people – 300,000 of whom are coming exclusively for the football matches, while tourists already in the country during the global championship will be around 1.8 million. The 300,000 ‘World Cup tourists’ are expected to be the biggest spenders, the Ministry says. They are likely to watch four games and spend about $2,200 during their stay in Brazil. This figure does not account for transportation expenses and other secondary spending, the survey indicated. The accumulated spending from the total 3.7 million is predicted to reach R$6.7 billion, or $3.03 billion. “The amount being predicted, based on surveys conducted by the Ministry of Tourism does not include indirect and induced spending. In other words, the total of tourism related financial transactions may more than double, taking into account the multiplying effect of these resources in the Brazilian economy,” said Minister of Tourism Vinicius Lages in a report published on a government website. FIPE based its estimates on an earlier study done in the wake of the 2013 Confederations Cup which was also hosted in Brazil. That sporting event, the Ministry said earlier, boosted GDP by nearly $4.4 billion. FIPE and the Ministry estimate that overall revenue created by the World Cup, including private and public investments, will reach $27.7 billion. But the lure of dividends might not be enough. On Thursday, hundreds of Brazilians demonstrated in seven state capitals where World Cup events will be held and urged the government to do more to improve what they said were poor public services. In many other cities as well, they decried the huge public bill the government has spent on building and improving venues for the World Cup. The protesters, represented by various advocacy groups, are campaigning to be able to hold demonstrations during the matches. Last year, similar protests against public transportation fee hikes led to several weeks of confrontation between demonstrators and police.